Have you been looking for a capable and affordable midsize sedan near North Andover, Haverhill, or Methuen? 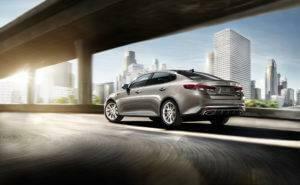 The 2017 Kia Optima is offered with three commanding engine options, including a 2.4L inline-four, a turbocharged 1.6L engine, and a top-of-the-line turbocharged 2.0L power plant. Top fuel economy comes from the turbocharged 1.6L engine, while maximum output comes from the turbocharged 2.0L engine. Each powertrain delivers solid power and fuel economy for the money, though. After taking a closer look at the performance specs of the new Optima, come in for a test drive at Commonwealth Kia, your Salem, NH and Lowell area Kia dealership in Lawrence, MA. For a starting MSRP from only $22,200, you can get the base Kia Optima LX with the standard 2.4L four-cylinder engine, which comes standard with a six-speed automatic transmission. Total output on this powertrain is measured at a capable 185 hp and 178 lb-ft of torque, while the EPA estimates that it gets 35 mpg highway and 24 mpg city. Starting at $24,140 MSRP, you can move up to the 2017 Kia Optima’s LX 1.6T trim level, which comes with a turbocharged 1.6L inline-four engine under the hood, as well as a dual-clutch seven-speed automated manual transmission. This powertrain combines to send out a confident 178 hp and 195 lb-ft of torque, as well as an impressive EPA-estimated 39 mpg highway and 28 mpg city. For those that really feel the need for speed, you can go with the SX trim level for an MSRP from $29,940, or the top-of-the-line SXL. Both of these trim levels come equipped with a muscular turbocharged 2.0L inline-four engine under the hood, as well as a standard six-speed automatic transmission. Output on this powertrain is downright sporty, coming in at 245 hp and 260 lb-ft of torque. That doesn’t mean you won’t get good fuel economy, though, because the EPA has estimated this powertrain at 32 mpg highway and 22 mpg city. If you’re looking for an affordably priced family sedan with a variety of capable and fuel-efficient powertrain options to choose from, the 2017 Kia Optima is the sedan for you. You can now get the new Optima in the trim and powertrain of your choice at Commonwealth Kia, serving all your automotive needs near Haverhill, Lowell, and Salem at 2 Commonwealth Dr. in Lawrence, MA. Our sales team is here to help you out, answer your questions, and take you on a test drive every day of the week. We’re also happy to answer your questions remotely, so don’t hesitate to contact us online or give us a call at (978) 685-3400.